Fatemeh was born to a middle-class family in the village of Lasht-e Nesha near Rasht, capital of the northern province of Gilan. She went to school in Tehran. During her high school years, when she was searching for a solution to social problems, she became acquainted with the opposition PMOI/MEK. The ideals the PMOI stood for made a new beginning in her life. In the 1979 uprisings, she was always at the forefront of all protests and demonstrations. Fatemeh was arrested during a mass protest on June 9, 1981 along with 80 other girls, mostly students younger than 18. They were taken to a stable made prison outside Karaj. In the stable, she refused to disclose her name in protest to her illegal arrest and the torturers failed to break Fatemeh despite severe pressure and tortures. Fatemeh’s motivation and determination to continue the fight against the religious dictatorship became stronger after the execution of her 17-year-old younger brother, Bijan, on February 8, 1982. In June 1982, Fatemeh was transferred to Ghezelhesar Prison when the stable was ordered to be evacuated. 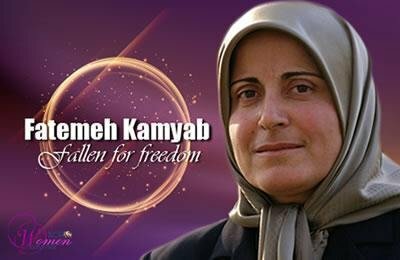 In Ghezelhesar, she was initially offered to be released if she agreed to make false confessions on the national TV against the PMOI/MEK. Fatemeh did not accept the offer and was consequently transferred to the punishment ward No. 8. She therefore spent one and a half years in ward 8. In a bid to break and bring her to her knees Fatemeh was transferred to Gohardasht Prison’s solitary confinement. Although she had been sentenced to one year in prison, she was released after three years. Upon returning home to her family, Fatemeh faced a life-changing choice. Her father who loved and cared for her well being hoped to have her beside him forever but Fatemeh who had witnessed the regime’s crimes against girls and women, and the tortures and mass executions of group after group of Mojaheds during her 4 years of imprisonment, was determined to continue her struggle and the path others had paid their lives for. She constantly searched for a way to join the resistance until she was finally able to reach Ashraf in 1987. Fatemeh was a model of patience and strength in overcoming every obstacle and undertaking huge responsibilities. Her calm and confident face with her beautiful smile reassured her companions when work seemed challenging and impossible. She could solve any problem with her patience and hard work. Fatemeh loved her comrades. She was a woman of dignity, self-discipline, strength and transparency, fully committed in fulfilling her duties. These made Fatemeh a reliable person whom everyone counted on especially during the long years of perseverance in Ashraf in the face of multiple attacks and under various blockades. Fatemeh was one of the 100 residents who remained in Ashraf after everyone else had been relocated to Camp Liberty. Her dedication and courage reached its ultimate peak during the tragic massacre of 52 Mojaheds on September 1, 2013. Her epical resistance on that day will forever represent the dedication and courage of Iranian women in their quest for freedom.